I got a crockpot for christmas last year, and have been absolutely in love with it since I got it. 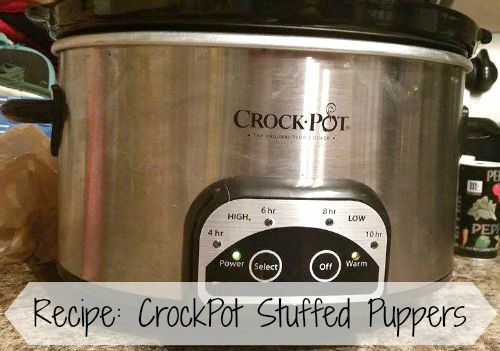 I'm always on the hunt for new recipes that I can make in my crockpot, and this is the perfect recipe to make in it. On the plus side - it's super simple to make and I always have leftovers! Depending on how many and how big your green peppers are is how much ground beef you should buy. I bought three medium sized peppers and needed a pound and a half of ground beef. I opted for lean ground beef as it creates less 'juice'. 1. Combine ground beef, egg, and instant rice in a bowl. Add as much garlic salt, pepper, and salt as you like. 2. Mix the above together using either your hands or a baking spatula. (for 1.5 lbs GB I needed to use 2 large eggs) Eggs act as the 'glue' that holds it all together, so add another egg if you need more 'glue'. 4. Take meat mixture and stuff the pepper until it reaches the top. 5. 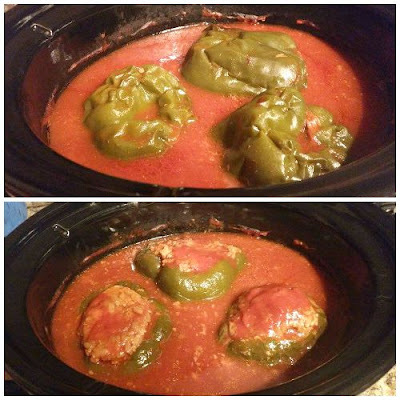 Put canned tomato soup on the bottom of the crock pot, place peppers inside, then top with another can of tomato soup. Then add one can of water. 7. Go about your daily business - and then come home to a delicious meal! If the sauce is too watery for your taste, add a little cornstarch until you get the desired consistency/thickness. This can also be made on the stove, on a low simmer for 2 hours with the lid on a pot. I just find it easier to cook in the crockpot. *Please note, I make this around 8am and don't get home until 6pm. This time can be shortened to as little as two hours on the stove.